In electronic / computing terms, "Firmware" refers to a small program or data structure that internally control various electronic devices. FingerTec terminals employ firmwares to operate its basic as well as high-level functions. By updating the firmware, we can fix bugs or add features to the device. This process involves loading a binary image file into the terminal. If the terminal’s firmware is outdated or corrupted, the FingerTec terminal will cease to work correctly and will result in slow response or even freeze. It is recommended to update the terminal’s firmware before performing any troubleshooting to the terminal. Make sure that the computer is installed with the TCMSv2 software. Without the TCMS V2 software, the firmware or language pack tool will not launch correctly. You can download the latest version of TCMSv2 software here. Disable the firewall or anti-virus software. Some of the firewall or anti-virus software will block the communication from the firmware or language pack tool to the terminal. You will need to disable the firewall or anti-virus software and update the firmware or language pack. Upon successfully updating the firmware or language pack, you may enable the firewall or anti-virus software. Disable the WiFi connection. Currently the firmware or language pack can only be updated using the LAN cable. If you update the firmware or language pack using the WiFi connection, the firmware in the terminal will be faulty or sometimes corrupted. You will need to determine your terminal’s platform before updating the firmware. 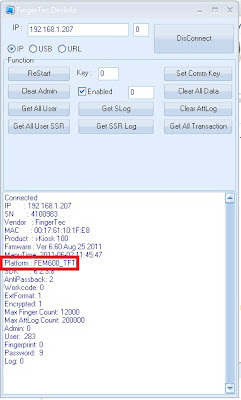 To check the terminal’s platform, you may download the FingerTec Device Info Tool here. 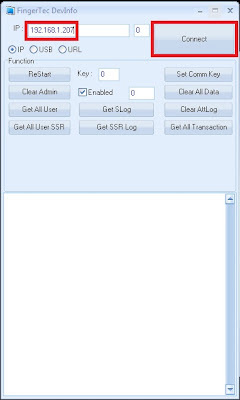 Extract the Device Info Tool and insert the terminal’s IP Address and click Connect. The black & white screen models such as TA100, R2, Kadex and etc have a limited storage space. The terminal can only store up to 2 languages. Please download the transaction logs before updating the language pack to free up more storage space. If your terminal already has 2 languages installed, you will need to delete the existing language before updating a new one. To delete the language, download the language removal tool here. Extract the file and follow the instruction manual to remove the language. If you update the wrong firmware version into your device. 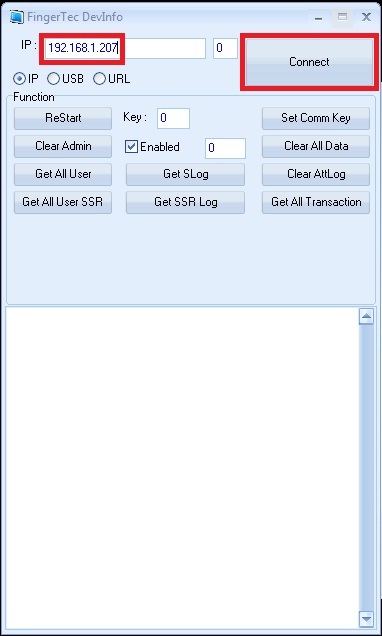 We will send you a loading hang firmware to solve the problem or provide us your team viewer id and password so that we can assist you remotely. I had the same issue after the update. Please advise how to fix it? I already replied and please refer your email. I think, previously you already send email to support@fingertec.com using email fa2006ab@yahoo.com. I already replied, so please refer your email. In the mean time, actually your device is in Hang mode, You can solve this using Loading hang tools. My device is FingerTec TA100C. I faced the problem was after firmware updated, it not working and unable to start. I wonder is it the incorrect firmware updated on it? Regarding your issue, may I know where did you downloaded the firmware update tool? Besides that, kindly inform us your device serial number in order for us to prepare the correct loading hang tool for your device. If you already send an email to us (support@fingertec.com), kindly refer to your email as I've already replied via your email. Our timekeeper retarted the Terminal R2 button and now our terminal R2 is not booting and only stuck in loading. How can we fix this? Thanks a lot. Kindly inform us your device serial number in order for us to prepare the correct loading hang tool for your device. 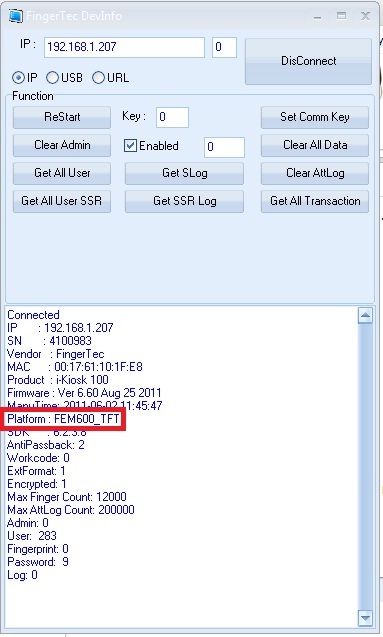 Kindly provide the serial number via email to support@fingertec.com together with the issue description and we will provide reply to you in the email. I have the same issue won't start up, stuck in boot screen and can't connect to the device anymore, I already send you an email. I have reply your email. kindly check your email and test ping the default IP address to check the device condition. I have received your email to support@fingertec.com , kindly check your inbox and provide the device information details. I have a FaceID2 Terminal FEM800 platform. I downloaded the firmware update file and updated the firmware of my terminal. Now the device can't boot. According to steps provided by FingerTec responding to my email i was able to ping the terminal successfully. But now i need the last step to update the terminal firmware to fix the booting problem.